You have heard of the pumped laser and maser. Here is a new type of pumped energy system: the vaser. 'Laser' is an acronym for 'light amplification by stimulated emission of radiation,' and 'maser' is an acronym for 'microwave amplification by stimulated emission of radiation.' I coined the term 'vaser' after reading an article in the June 2014 edition of Model Aviation about a relatively new form of radio controlled (R/C) model sailplane sport - dynamic soaring - that, using a specially developed technique to exploit geography and prevailing winds, produces aircraft speeds of more than 400 miles per hour. Per my definition, 'vaser' is an acronym for 'velocity amplification by stimulated enhancement of energy' (OK, it's a lame attempt at being clever). It occurred to me that the mechanism used to add energy to electrons in atoms is fundamentally the same as that used to add energy to the sailplane in dynamic soaring. In pumped laser and maser systems, an external power source (stimulus) is used to cyclically add energy to the electrons of certain elemental atoms by forcing them into higher level orbitals. Since the electrons naturally want to reside in their ground state, they return there once the stimulus is removed. The difference in energy is emitted as electromagnetic radiation at a wavelength concordant with the Planck equation, λ = (c · h) / (E2 - E1), where c is the speed of light, h is Planck's constant, and E2 - E1 is the energy level difference. A diagram of the laser pumping mechanism is provided below. With dynamic soaring, the sailplane is analogous to the electron, altitude is analogous to orbital energy levels, and orographic lift is analogous to the external pumping energy. Orographic lift is generated when the horizontal component of an air current (wind) is forced to vertical in the presence of an upward sloping surface such as the windward face of a slope (see diagram below). To begin the dynamic soaring cycle, the model sailplane is launched at the top of the ridge and it is lifted by the high speed upward moving air, thereby increasing its potential energy by virtue of an altitude gain. 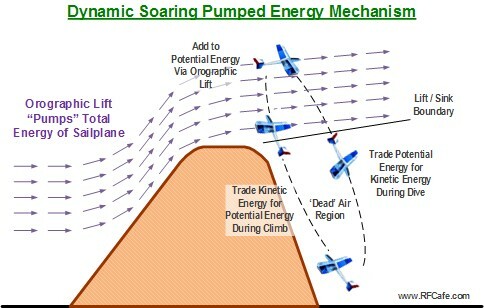 At some point on the leeward (downwind) side of the slope, lift is significantly reduced and the model is placed in a dive, exchanging potential energy for kinetic energy (speed). According to a location determined by the experienced pilot, a sharp is executed at the bottom of the loop and the sailplane zooms back up, loosing kinetic energy (and therefore speed) in the process, but regaining some potential energy. 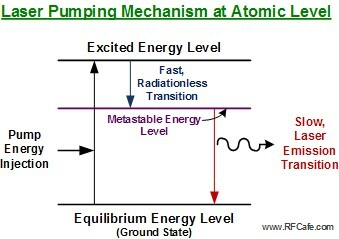 Aerodynamic drag and heating losses expend some of the total system energy, so without an external energy source to replenish the lost energy, the model would not be able to reach its beginning altitude; this is analogous to the emitted radiation. However, the orographic lift impinges upon the sailplane when it breaches the top of the ridge and pumps energy back into the system (the model). Since the sailplane, if piloted skillfully, was traveling faster at the breach point during this cycle than during the previous cycle, it reaches a higher altitude this time, resulting in an even greater potential energy. The dive/climb cycle is repeated until the model reaches its maximum speed. Nifty, n'est-ce pas? Interestingly, the albatross figured out dynamic soaring a long time ago. IEEE's Spectrum magazine published a story, "The Nearly Effortless Flight of the Albatross," and a video (see below) last year, but they did not point out the pumped energy analogy. What ultimately limits the speed the sailplane can achieve? The airframe is a major factor since its aerodynamic drag saps energy from the pumping system. Assume for the sake of argument that the pilot is perfect, never making a mistake and flying the course flawlessly. Frontal cross-sectional area as well as presented cross-sectional area during turns slows the model down via resistance to the wind. At such high speeds and G-forces, flexing of all components occurs, thereby increasing cross-sectional area. Another factor is the robustness of the airframe regarding stress loading from all three axes. Finally, the geography of the landscape and wind characteristics limit the maximum height and thereby maximum potential energy for a given location. The vertical component of orographic lift diminishes with height above the ridge, and at some point cannot lift the sailplane any higher. The speed of sound at sea level is 761 miles per hour (mph), so Spencer Lisenby's record speed (as of this writing) of 468 mph is Mach 0.61! A video of his record flight is posted below. The airframe must be incredibly strong to endure such dynamic forces. In fact, the Kinetic 100 DP used is a hand-made sailplane made for speed. Carbon fiber construction comprises most of the airframe components in order to achieve the highest strength-to-weight ratio possible. It has a 100" wingspan and weighs about 250 ounces ready to fly, including the airborne radio control system. Ultra high speed /high torque servos as used on all control surfaces, and cost around $60-$80 each. You must get placed on a waiting list to own a Kinetic 100 DP, and expect to shell out close to $2,000 for it.